que ceda el paso a una nueva generacion. –al regresar.–que ironia! –empleados de salud se lanzan a la calle, para repudiar la perdida de beneficios medicos. –maestra dominicana es asesinadatras ser golpeada al salir de la escuela donde trabajaba,se sorprendera al saber quien la mato . –pudo terminar en tragedia la celebracion de los hinchas de chile en el maracana, tras la victoria en el mundial. 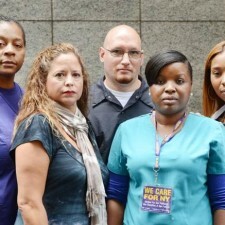 Thousands of nurses and caregivers, members of 1199SEIU United Healthcare Workers East, plan to picket at more than 100 healthcare facilities in the New York City area Wednesday. The healthcare union is in the midst of contract negotiations with the League of Voluntary Hospitals and Homes, an employer group that represents 109 private hospitals, nursing homes and other clinics in the area that acts as the bargaining agents in labor contracts. 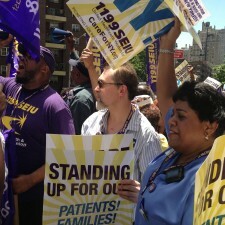 New York City- On Wednesday, June 18, thousands of nurses and caregivers will be holding protests for quality care and good jobs at over 100 facilities throughout the New York City area.